Feeling mild? 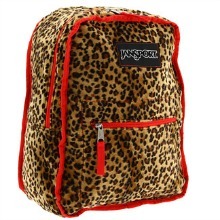 Then keep it simple with the red solid side of this JanSport™ backpack. Feeling a little wild? Then up the fun with the reversed side that features a fun Leopard print design! A reversible backpack for mild and wild color options. Straight-cut, padded shoulder straps with a detachable swivel hook for reversing. Fabric: 600 Denier Polyester / 200 Denier Polyester. Dimensions: 12″ wide across bottom, 11.5″ wide across middle, 9″ wide across top x 6″ deep x 16.5″ high.